We're fortunate to work with many community groups throughout Metro Vancouver who focus oodles of time and energy into making our region a more vibrant, engaging place to live. Recently, Modo has partnered with the Vancouver Public Space Network (VPSN) to sponsor transportation for some fantastic placemaking initiatives, including: PARK(ing) Day, bringing a longtable for communal lunching to a Robson Street parking spot; Keys to the Street, placing a piano at the Vancouver Art Gallery for anyone to play; and PS (Public Space) I Love You, hosting a day-long photo-hunt of Vancouver landmarks. We'd like to thank the VPSN and its dedicated volunteers for bringing creative, people-focused fun to our communities! Follow the VPSN on Facebook and Twitter for volunteer information and upcoming events. This past Monday night, we held a Special General Meeting of Modo's members. The evening was filled with active discussion as members considered a number of changes to our official rules. The meeting approved rule amendments that included how we nominate and elect directors, how the co-op manages its investments and how financial distributions may be paid out to members. The membership also approved a change allowing businesses to become shareholding members of the co-op, bringing the benefits of full membership to the numerous co-ops, credit unions, social enterprises, not-for-profits, and other businesses in our community that use Modo. Finally, the meeting was topped off by changing our legal name from CAN Co-operative Auto Network to Modo Co-operative, a culmination of our recent, successful rebrand. Find the full details of these rule changes posted on our website. As Modo has grown, improved its service and increased its community impact, it is important to ensure the rules we use to govern the co-op are up to date, effective and reflective of our core values and mission. The board of directors worked over several months to draft the modifications to our rules, but it was the active and engaged participation of our members in the process that secured a positive result. I want to extend my thanks to all the members that emailed us with feedback or came to the meeting to participate in Modo's democratic process. I'm excited about Modo's future. And I'm proud that as a co-op, Modo's role in our region's sustainable transportation future is ultimately in the hands of our members. Want to learn more? Modo member Mark Latham offers his report about this "fascinating exercise in democracy" on his blog. Click below to watch Modo in action as we help the Westside Mobile Food Market tackle the issues with food deserts on the Westside! 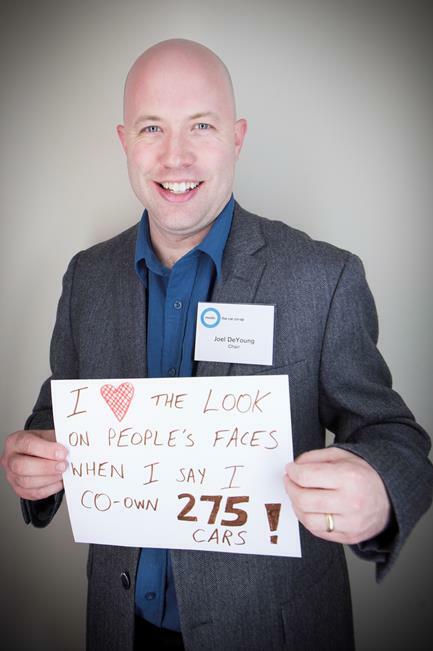 >> In honour of this month's CarSharing Association Conference (Sep 16–17 in Toronto), we whipped together these fast facts on carsharing around the world. 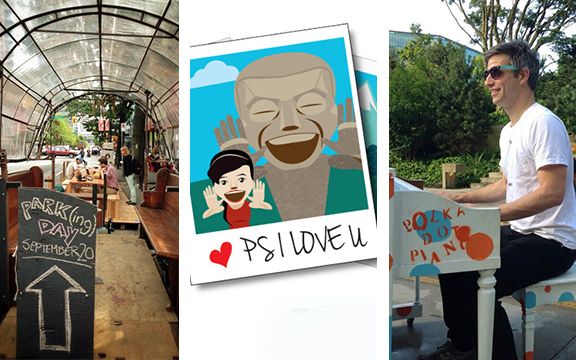 >> Modo was proud to sponsor (PARK)ing Day with the VPSN this year. Learn more about this fun, international project! >> The Westside Mobile Food Market connects seniors living in food deserts with fresh, affordable food, using Modo for transport. Read about their Plenty Campaign and watch the video to see this fantastic program in action. Add this calendar to your iCal or access it via Google Calendar! This Friday, Modo will be at the North Shore Green Markets from 5–10pm. at the Shipyards Plaza. Located one block east of the Lonsdale Quay and Seabus terminal, find locally gorwn fruit and vegetables, along with organic meats, local artisans goods and more. The market happens every Friday at Shipyards Plaza, as well as Wednesdays at North Vancouver Civic Plaza, 141 West 14th Street. In 2009, Culture Days began its mission of building a national network of cultural connections to provide all Canadians opportunities to participate in, and appreciate, all forms of arts and culture. Vancouver's offerings this year span a wide variety of arts and culture including, but not limited to: free ballet classes at the Goh Ballet, coffee with the programming director of the grunt gallery, and MetamorFest, at which you'll find Modo's Sharing Station this Saturday. Following the success of their seed and food swap, the Cedar Cottage Food Network is holding an Autumn Harvest Social from 11–1pm this Saturday at their location on 4065 Victoria Drive. Meet with folks from the area and share homegrown produce and homemade preserves, and take in some excellent cooking and canning demonstrations. And you can bet there will be some tasting opportunities, too! Share a love of reading and your favourite books at the Kits Book Hub launch! Swing by Arbutus Coffee (2200 Arbutus Street), grab a beverage and peruse this permanent outdoor bookshelf. If you have a used book or two you'd like to donate, bring it along and share with your friends and neighbours in Kitsilano. After a long hiatus, In The House Productions Performance Series is back! "World At Your Door" celebrates Burnaby's diverse cultures through music. Chinese, Persian and South Asian music set the stage for the first show of this wonderful series. For ticket information and future shows, visit their website. Modo Community Partner Project Space presents the second annual Vancouver Art/Book Fair, this year held downtown at the Vancouver Art Gallery. Did you know this is the only international art/book fair in Canada, as well as one of only two on the West Coast? The two-day festival features nearly 100 local, national and international publishers of books, magazine, zines, printed ephemera and digital or other experimental forms of publication, as well as on-site programs, performances and installations. The power of the social economy is growing in BC. Cooperatives, non-profits, credit unions, charities and social impact businesses have created more jobs in our province than traditional industries. Realize Opportunity explores the role of BC's social economy and opportunities for partnerships between these organizations, government and the private sector. Hosted by Realize Co-op. Find event details and RSVP for the full conference and/or the breakfast seminar. To wrap up Waste Reduction Week, the Britannia Green Team is hosting Sustaining Our World at the Britannia Community Centre on Commercial Drive. Expect a full day of activities including a Sustainability Fair (located in Gym D) from 12–5pm; the second annual Britannia Race to Zero Waste, for folks who enjoy a challenge; and will end the day with a screening (7–9pm) of The Clean Bin Project. Stay tuned to their blog for more details and race registration as the event draws near. Bike To Work Week is one of our favourite events at Modo! Many of our staff and members are dedicated cyclists, and carsharing is a fantastic complement for their transit strategy. Brought to Metro Vancouver by HUB: Your Cycling Connection, this week not only encourages cycling but celebrates it with Commuter Stations across the region. Register as an individual, with your workplace, or join the Modo team at www.biketoworkmetrovan.ca. Delight in divine dining, incredible deals and a fun night to support frontline HIV/AIDS organizations in Vancouver. Tickets for Gambado! at Performance Works on Granville Island can be purchased for the dinner and auction, or auction only. Presented by Modo Community Partner Shooting Stars Foundation. A 2010 red Dodge Caravan (#320) is temporarily at Knightsbridge. We are continuing to seek a permanent home for this vehicle west of Denman Street. A 2009 red Nissan Versa Hatch (#248) has replaced the 2010 Toyota Prius. A 2013 grey Nissan Sentra (#481) has replaced the 2009 Nissan Versa. A 2013 grey Nissan Sentra (#480) has replaced the 2006 Toyota Corolla. While the Evergreen Line is under construction, we cannot access our Lougheed Mall parking spot on Gatineau Place. Until we find an alternative, we now have two cars at our Keswick Park location, southwest of the Lougheed SkyTrain Station.